A large bird-of-prey commands its position atop a slightly delineated perch—the bowl is both refined and gutsy—being a little heavier than typical. Carved from a beautiful specimen of ash burl, the whole maintains a dark, richly patinated surface. Ladles or scoops were personal objects. Every Woodlands Native had one that they would eat with at each meal. The totemistic carvings were personally meaningful and reflected something intimate to and about its user. 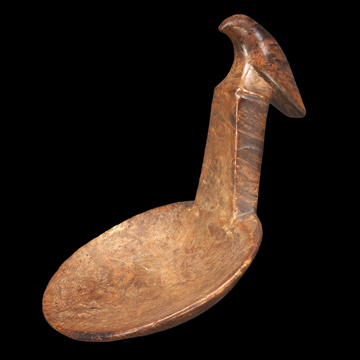 Ladles are larger than European spoons and were held so that the palm would hold the back of the bowl, and the thumb atop the middle of the handle to balance and secure the ladle in ones hand. Their outsized bowls were employed to complement the Woodlands diet, which mainly consisted of corn, bean and squash-based stews.